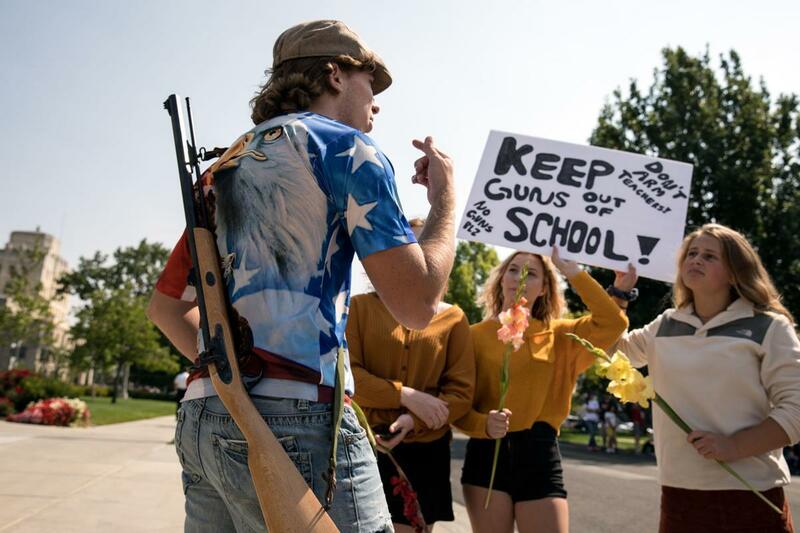 BOISE – On the steps of the Idaho State Capitol Building, issues of Second Amendment rights and gun control played out not at the hands of the nearly 1,000 who came to march in support, but on a smaller scale – a handful of youth rally-goers and protesters, both claiming to echo the views of their generation. The 2018 Idaho Rally for the 2nd Amendment held on Saturday gave Idaho gun owners and those who support gun rights a chance to come together and voice their support for the unalienable right to bear arms. Locals as well as people from neighboring states joined the rally that has taken place since 2012. At 1 p.m. standing in the back of a pick-up truck at Fort Boise Park, Adrik Fisher stated he was the “anti-David Hogg”. The 16 year old from Mountain Home challenged the 18-year-old activist who became a face of the gun control movement for younger Americans after surviving of the Stoneman Douglas High School shooting in February. The legacy of armed citizens is a fundamental aspect of America, he said. His speech was met with cheers and shouts that he was the true young face of the nation. Hundreds of marchers in rally made their way from the park downtown to the State Capitol Building escorted by the Boise Police Department. The parade was met with more supporters at the end. While Second Amendment heroes Ammon Bundy, who led the armed occupation of the Malheur National Wildlife Refuge in 2016, and Erich Pratt, from Gun Owners of America, made rally cries into the microphone many in the crowd started to notice four young people who didn’t seem to fit in. The group of 16-year-old juniors from Boise High School stood quietly holding flowers and a sign that read “keep guns out of school.” Ella Weber, Searra Ade, Tommy Barrow and Bryn Harris, began garnering attention from marchers. The group was met with both understanding conversations and confrontation. Nampa resident Aidan Shuck, 18, was among those in the crowd that had their firearm casually slung across their backs. “I see where they’re coming from,” said Shuck after a lengthy conversation with the protesters about guns in schools. Shuck agreed that arming teachers is not the solution to the problem and that heavier regulation and evaluation of gun buyers is a step in the right direction. But, as someone who grew up around guns, he said, the Second Amendment is a right that can’t be disputed. Joshua Willard’s sign read, “ban idiots, not guns”. The 22 year old from Homedale argued that it’s not the gun that is the problem but the person pulling the trigger. It takes a level head to handle a gun in an intense situation, he explained, but you can’t take that right away from those who can do it. “There are enough veterans to place one, armed, at every entrance at every school in the country, “ he said. Published: Sept. 9, 2018, 9:45 a.m.